← Getting down again can’t be that hard can it? 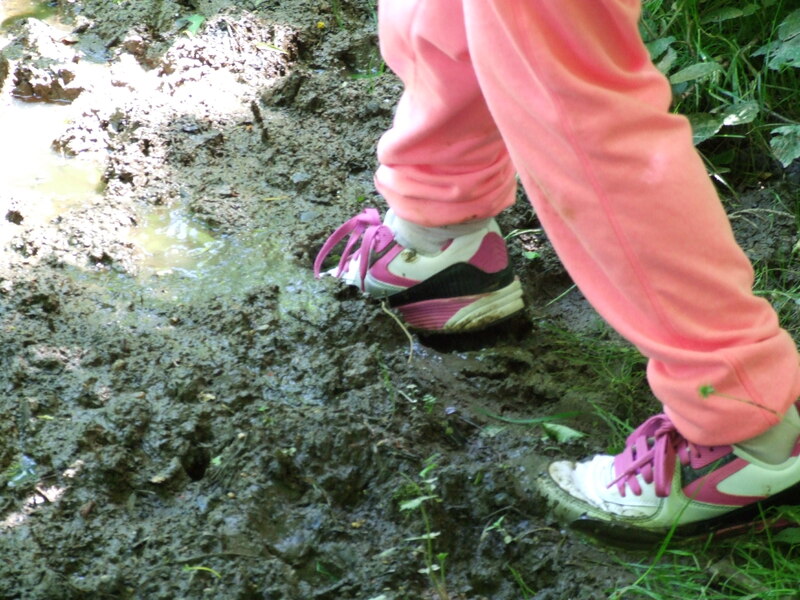 Over the weekend we went for a walk across a muddy field and the further across we got the deeper our feet sank. My daughters were complaining of sinking when their feet were on the ground and that their feet were too heavy when they were mid step. The mud from the field was clinging to our feet and once we got to the other side we spent several minutes trying to shake and clean the mud off. Once my boots were clean of the clinging mud it was so much easier to walk. It’s easy to focus on throwing off sin, after all if something is wrong in itself then we should want to be free from it. Sinful actions case damage to us and those around us and we need to work at cleaning them off and being rid of sin. 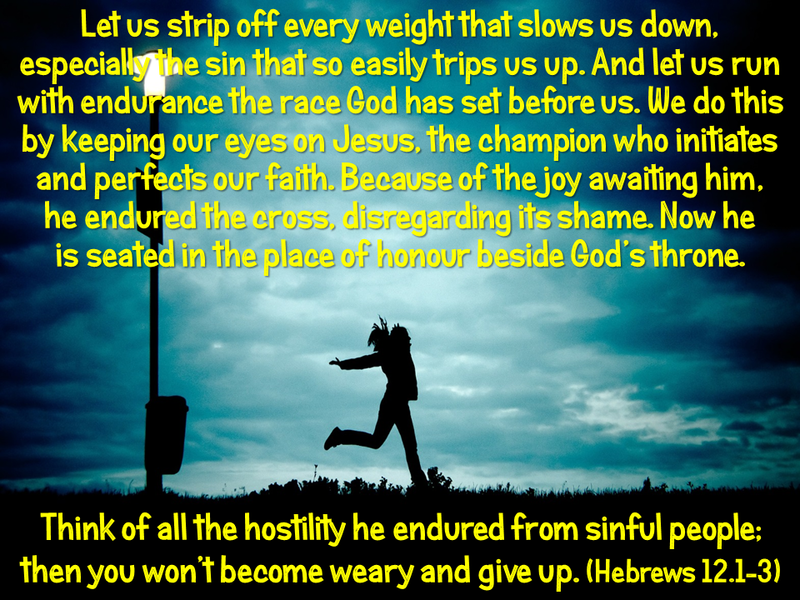 The verse also refers to ‘every weight that slows us down’ as being distinct from sin. There are things that in themselves aren’t wrong but they can still hinder us from living for Jesus. Jesus is with us always and I guess that one test for whether something is a hindrance or not is to consider whether we can enjoy that activity or thing whilst also remembering that God is with us. For example, a hobby can be time consuming but something we enjoy as we are conscious of God’s presence or it can be something that causes us to forget God as we become consumed in it. In the parable of the sower ‘the worries of this life, the lure of wealth, and the desire for other things’ are all hindrances that kill and damage faith. All this mud reminded me of a walk I took near Blakeney point a few years ago. I was a responsible (yes I know, it’s funny isn’t it) adult on a school trip. We took a boat out to see the seals and then walked along the beach and then because the tide was out, we headed back to where we started across the mud flats. The person leading the activity told the children to follow him and walk in his steps. If we stayed in his steps then we would avoid sinking too deep. So we took our socks off and tied our shoelaces together and hung our shoes around our necks and we then set off following the leader. The role of the adults was to be spread out at various points in the line urging everyone to keep our eyes fixed on the leader and to walk in his footsteps. 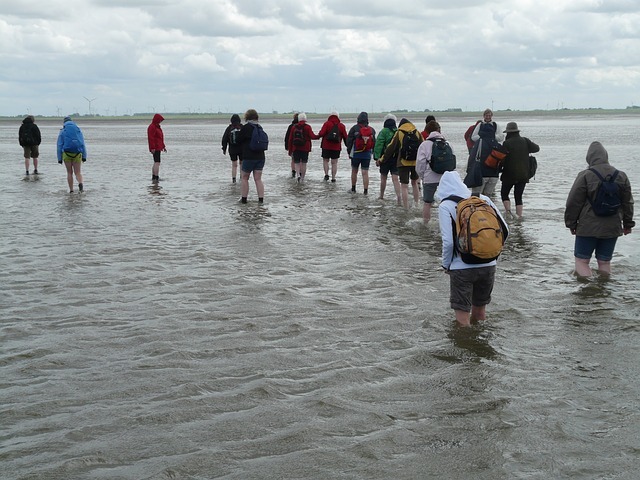 In this picture which shows similar conditions you can see how spread out everyone is, they are choosing to walk their own routes and so there is more of a risk of sinking. As we live our lives for and with Jesus, we should look to him and live as he lived. He goes before us showing us the way to travel through life and he also shows us how to live perfectly. He faced opposition and even a painful death on the cross and yet he kept going for the joy of obeying God his father and the opportunity to save us. What is holding us back? What do we need to throw off? How are we looking to and trying to live like Jesus? Are we following him and living his way or are we carving out our own route through life? This entry was posted in Bible, Faith, freedom, Jesus, Life experiences and tagged fix your eyes on Jesus, Hebrews 12 1-3, running the race, throwing off sin. Bookmark the permalink.